We deal with an enormous volume of requests to help with rehoming cats, and we can only help a limited number by bringing them into our own care. If we are unable to help ourselves, owners are welcome to advertise their cats for rehoming on this page and potential new owners can contact them directly. The cats shown here are not in branch care and the only information we know about them is shown here. Cats Protection have not seen these cats and cannot guarantee the accuracy of the information provided, especially regarding health or behaviour. Arrangements to adopt a Direct Homing cat will be made directly with the owners. If you live in the Bournemouth area and would like to use our direct homing noticeboard, please email a photograph and short description of the cat to us, together with the contact numbers you would like us to publish for you. Tinker and Tailor are an affectionate pair of 14 year old cats who need a loving new home together as sadly their owner has died. Tinker is the black female and Tailor is a tabby boy. They are used to going out into a very secure garden only. They have no known health issues and are neutered, vaccinated and microchipped. Do you have the purrfect home for them to spend their retirement years? If so, please call Ann-Marie on 01425 278118 who can tell you more about this lovely pair. "Tatty is a friendly and intelligent black female cat, semi long-haired about 5/6 years old. A delightful and affectionate pet, We took her in knowing her history and she settled well. BUT she has terrorised our two older cats, to the point where they have to be kept completely separate. So we reluctantly need to find Tatty a new home. She has always lived on the Forest so has *no traffic experience*. She is spayed and micro-chipped. Easy to feed (greedy!) Suited to an adult household or one with older children, as she is playful and might over-react with the very young. She might be all right with sober, older dogs but dog-free would be easier for her. We will supply bed, toys, a supply of food and dishes, cat flap for installation (if you don't have one) and anything else that will help her settle. Also, if things didn't work out, we would take her back – and we'll hate to see her go, but our cat is suffering badly from Tatty's intimidation! We would want to visit any offered home, and we would request that whoever takes her makes a donation to a local pet charity of their choice. But once she settles, we hope you will find her as delightful as we do!" 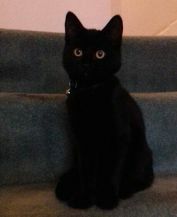 Joey is a very cute, active, playful and a bit mischievous 4 month old. Small children adore him and he loves playing with them. He is currently the only pet in the household, but has interacted with other cats visiting his garden. Joey loves to curl up on a lap when he's tired himself out. He's looking for a new home as he has more energy than his current senior human companion!